Are you ready to turn your backyard into the ultimate summer stay-cation? Summer is just around the corner which means it’s the perfect time to turn your space into a relaxing retreat. One way to do this is with a poolside deck or outdoor living space. The following are important considerations when planning your pool and deck/outdoor living project. 1. How do you plan to use the space? Function is a very important factor to consider when planning for your new space. Will you just need space for a couple chairs and a place for towels? Or do you want enough space for a grill and table for dining? How you plan to use the space will go hand in hand with how much space you need and how to best plan for your project. 2. Is your pool above ground or built in? If your pool is above ground, do you want a wrap-around deck, or a deck on just one side of the pool? 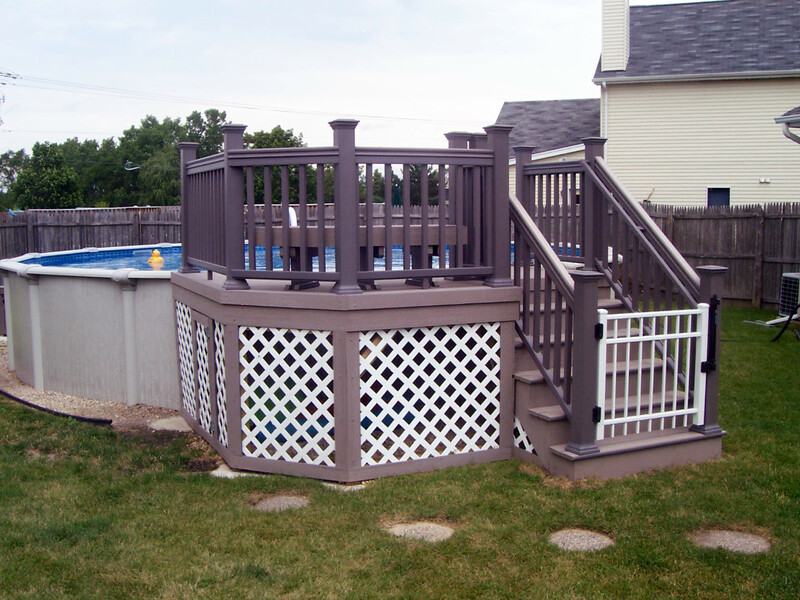 We can install decks that are on one side of the pool or that wrap around. Function wise, a wrap-around deck may not leave you with much space for seating or grilling, as much of the space is used for walking around the deck. Having a pool deck that’s built on one side of the pool gives more room for purposes such as lounging, grilling, or dining. If your pool is built in, remember decks aren’t the only outdoor living space to consider. Paver patios are a great way to compliment your pool. Paver patio designs can create aesthetically pleasing landscaping to your space. When building a patio, we always suggest pavers over concrete, since they are easier to maintain and require fewer repairs. 3. Do you already have an existing pool and living space installed? Not every project needs to start from scratch. Many of our clients build in stages; do you just want a project to compliment what’s already in your yard? 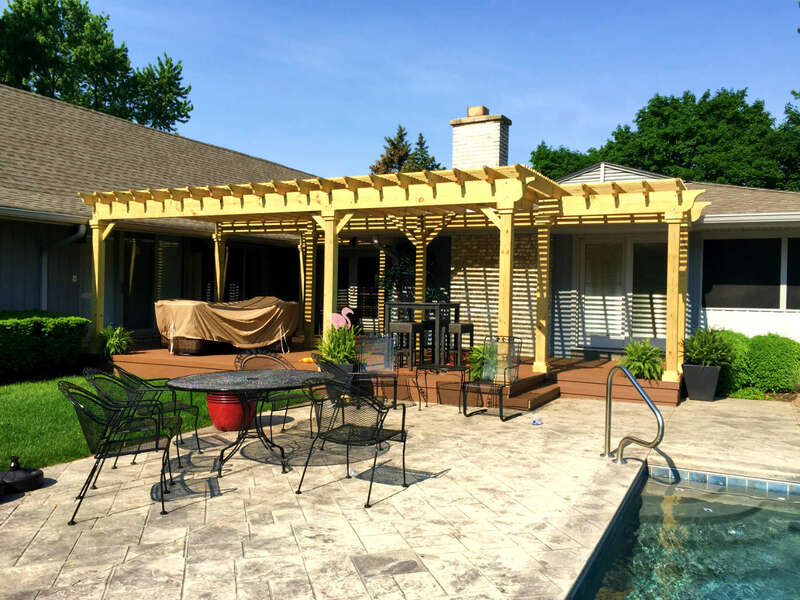 Adding a deck coming off the house to an existing built in pool area or pergola for shade creates an extra place for gathering with family and friends and makes a great area to watch the kids play in the pool. 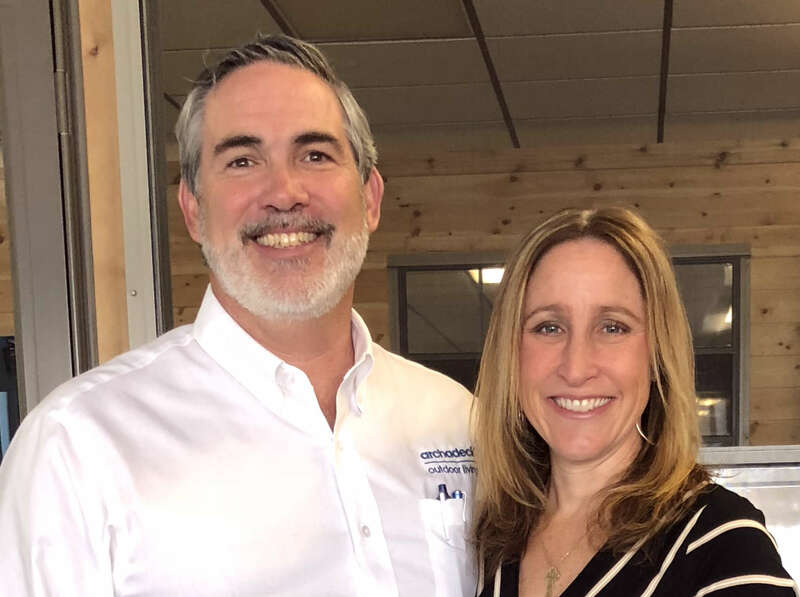 There are many variables that go into the cost of a poolside deck or outdoor living project. The materials used, for instance, if you use wood or low maintenance/composite decking, as well as the size of the space will be important factors that determine the project cost. 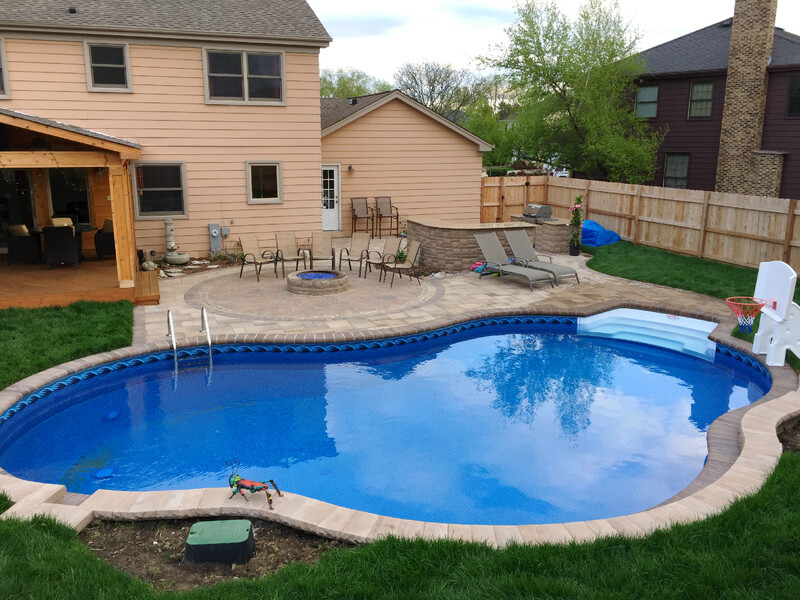 If you have an above ground pool and are considering a wrap-around deck, or adding a deck to a circular pool, it will cost significantly more than a deck on only one side of the pool. If you are considering adding a deck or outdoor living space to your pool area, we would love to hear from you! Contact us for a Free Design Consultation Consultation or call us at 847-496-4333.